Galapagos Islands Have Been Invaded Dozens Of Nonnative Marine Species The number of alien species, likely brought by ship traffic, stunned scientists. And they suspect that the foothold of such creatures may have been underestimated in other tropical habitats, too. 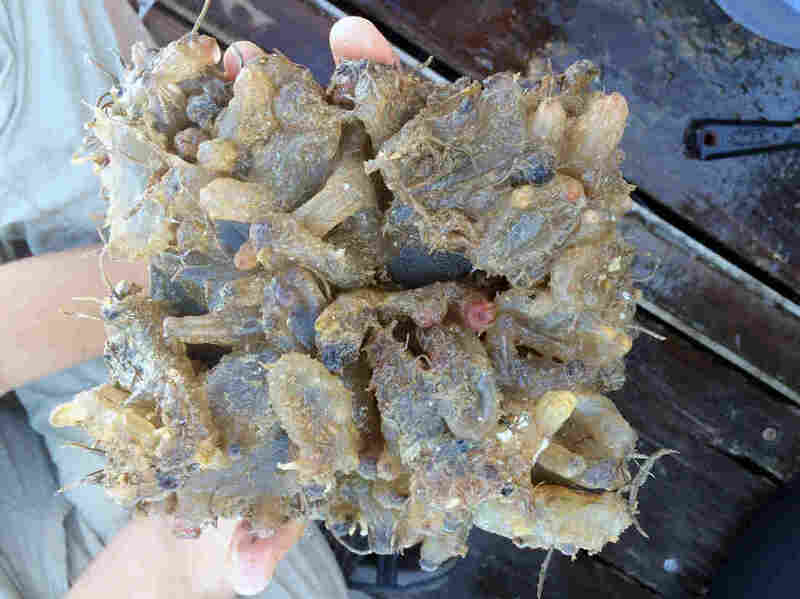 The sea squirt Ascidia sydneiensis, a tubelike animal that squirts water out of its body when alarmed, is one of 48 additional nonnative marine species in the Galapagos Islands documented in a newly published study. Previously, researchers knew of only five. Marine biologist James Carlton remembers when he first got to thinking that the famously wild Galapagos, a World Heritage, might not be as pristine as people thought. "On my first visit to the Galapagos," he recalls, "I collected some samples from a boat bottom." He found barnacles, sponges and other hitchhikers. That was in 1987. Carlton didn't know if the creatures he found were native or not. So about four years ago, he and a team of scientists decided to return and take a closer look. "We didn't know quite what to expect," he says. They already knew there were lots of invasive species — species not native to the Galapagos — on land. But in the surrounding ocean, there were only five known species of invaders. Everything else, presumably, was native. When Carlton's team looked underwater, however, they found a horde of invaders. "Now we have 53, which is a rather stunning increase," says marine biologist Gregory Ruiz, who was on the trip. "It's about a tenfold increase." He says there's no question now: "The Galapagos has been invaded" underwater. Ruiz says they found exotic species clinging to pilings, docks and mangrove roots. The researchers hung plastic plates underwater and all sorts of alien invertebrates latched on. It's hard to tell where the invaders came from, Ruiz says. 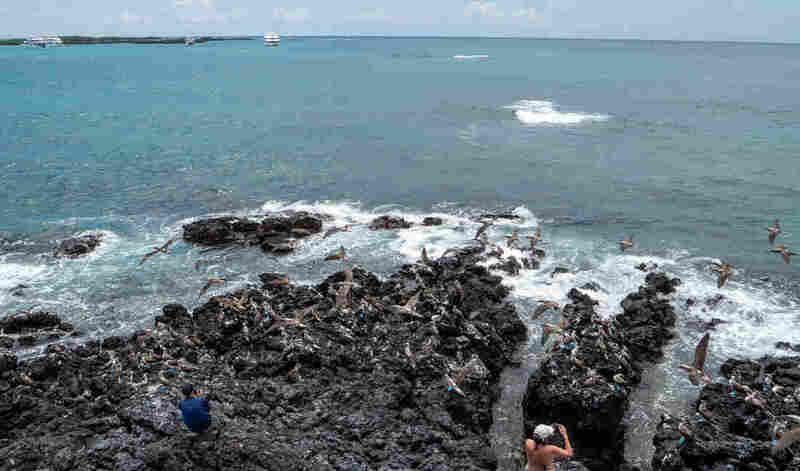 But rising tourism in the Galapagos means more boats, docks and pilings — transportation and homes for invasives, wherever their initial source was. At the Smithsonian Environmental Research Center in Maryland, where Ruiz works, there's something called the "invasions lab." About forty researchers work there, tracking invasive species around the world. Ruiz points out a gelatinous blob in a glass bowl of alcohol. "This is an organism that we found in the Galapagos," he says, "it's a tunicate." It's commonly known as a sea squirt, a tube-like animal that squirts water out of its body when alarmed. "It often attaches to the underside of docks or on vessels," Ruiz explains. More invaders sit in glass bowls filled with alcohol — barnacles, algae, sea anemones. The creatures are described in the journal Aquatic Invasions. In all, the team of scientists found 48 additional marine species that came from somewhere else. These organisms aren't just footnotes in a biology text. Zebra mussels, for example, invaded the Great Lakes in the U.S. and caused havoc. A tiny parasite called MSX has killed millions of oysters in the Chesapeake Bay on the East Coast. Invasives can outcompete and push out native species. Rising tourism in the famously wild and protected Galapagos Islands means more boats, docks and pilings — which provide transportation and homes for invasive species. Carlton, a professor emeritus at Williams College, says tracking invaders helps authorities stem their spread. Nonetheless, he expects that the situation in the Galapagos isn't unique: The explosion in international trade and boat traffic and tourism is probably ushering invaders into many tropical locales. But in a protected place like the Galapagos, their presence means something's been lost. "We value a world that we think represents nature before we began altering it," Carlton says, "before we began removing species, adding species and changing the abundance of species." Places such as the Galapagos are windows into that former world, as well as a living history tour of how evolution works to create unusual forms of life. "In fact," Carlton says, "we're studying only the result of alterations by human activity in just a couple of hundred years." Ironically, he adds, the author of the theory of evolution, Charles Darwin, may have contributed to the alteration of the Galapagos. Darwin's ship, the HMS Beagle, sailed there in 1835 after visiting what is now Brazil, Argentina, Chile and several other places — bringing with it, in most likelihood, alien invaders.